This is one big year for Chevrolet. Not only are they introducing two all new products in the compact and subcompact field, the Chevy Cruze and later this year, the new Chevy Aveo. They also are finally bringing the long awaited 2011 Chevrolet Volt, an electric hybrid car which can go 40 miles without needing to charge the battery. In fact, let’s start with the front wheel drive Volt. Most important to consumers who may be a bit wary, the Volt has a range of 300 miles or so on the 160 horsepower turbocharged, 1.4 liter engine that is part of its power train system. It can hit 60 in nine seconds, and for consumers worried about the car’s practicality, the battery system of the Volt is backed by an eight year, 100,000 mile warranty, an important propulsion system carries a 10 year, 150,000 mile warranty. Standard equipment includes air, full power accessories, antilock brakes, stability control and traction control, and the usual accoutremnebt of airbags. 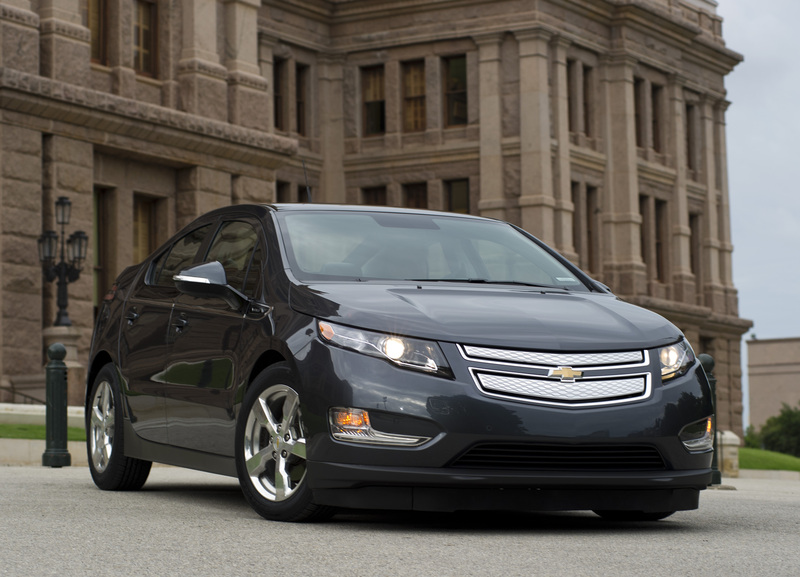 The Volt won’t be cheap, of course. It costs around $41,000 but it will qualify for upp to a$7,000 tax credit Inside, the Volt lis every bit as futuristic as you would expect, with an interior dominated by an aluminum rimmed center console, and easy to understand gauges and controls. 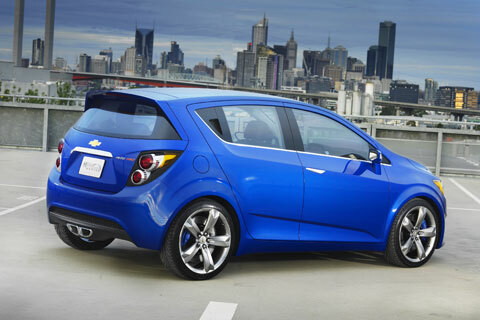 Chevy Aveo Wait until you see the 2012 Chevroilet Aveo which comes out later in the model year. As different from the current Aveo as it can be, the new model is far sexier, bolder looking and aggressive than the current mode,. Quality is way up on the new model, along wiih the kinds of interior trims used. In the meantime, you have the current Aveo, which is unchanged except for a couple of new colors. Cost of the current Aveo is just under $13,000 to start, and its 1.6 liter 108 horsepower four gets 25 to27/34 to 35 miles per gallon. Chevrolet Corvette Many people of course, consider this car to be America’s sweetheart, never mind that there’s an unmentionable pony car over at Ford that could qualify for that title. For 2011, look for a beautiful new design for road wheels, some new colors, bigger cross-drilled brakes, an optin that offers blue, red or yellow contrasting stitching, and headlamps with contrasting colors, too. 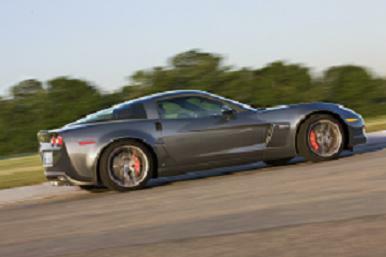 Corvettes start at about $49,900, and the standard 6.2 liter, 430 to 436 horsepower V-8 gets 14-16/20 to 23 miles per gallon. Chevrolet Cruze Chevrolet Cruze could be the most important car yet for Chevrolet and for General Motors. After all, it will compete in the volatile compact car market, vying for sales attention with Ford’s soon to be new 2012 .Focus, the all new Hyundai Elantra, when it comes out, the Toyota Corolla, Honda Civic and a number of other stalwarts. 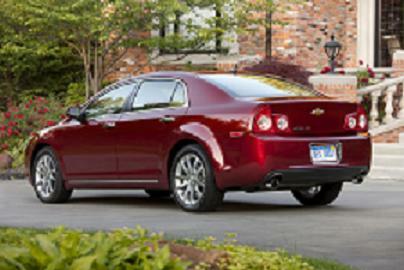 But Cruze has much to recommend it, including a vastly upscale interior that features two toning and better materials, the possibility of 40 miles per gallon, and a turbocharged 1.4 liter, 138 horsepower four cylinder engine on the LT and LTZ models. Other engines include the 1.8 liter engine that has a 138 horsepower ratinbgl. The difference is much greater torque offered in the four. Everyone knows that so-so equipment and a plain Jane ambiance don’t sell compacts anymore, and Chevy thus offers all manner of luxury equipment ono the Cruze. Look for offerings like Bluetooth, a powerful nine speaker sound system and even navigation, a rarity in compact cars. 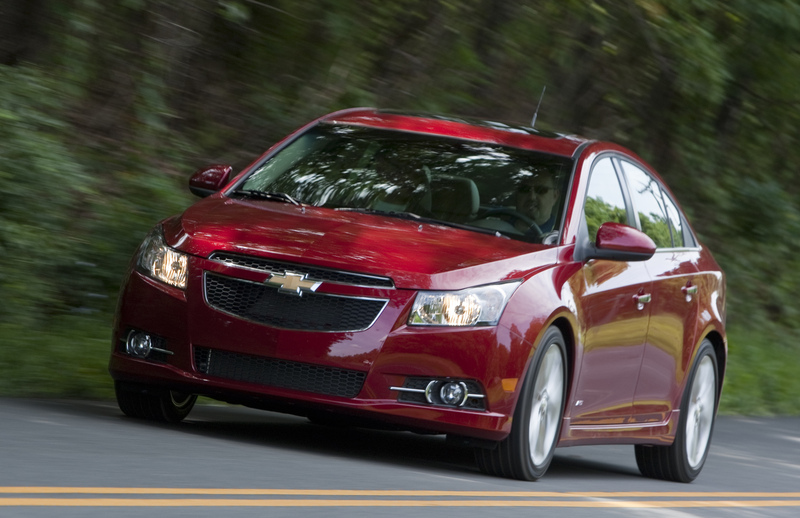 Prices for the Cruze start at $16,995, and top out at about $22,700. Gas milaage ratings are 24 to27/35 to 40 miles per gallon. 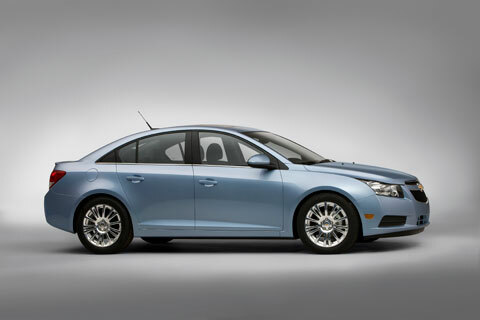 You can get either a six speed manual or a six speed automatic on the Cruze, too. Chevy Impala Nothing new here on this popular full sized sedan for 2011, except for adding flex fuel capability to its 3.5 litrer base engine, some new featuers like flip and fold flat rear seats, eight speaker Bose Audio, XM subscription and a few other items in the new Luxury Package. Prices start at $25,215 to $30,755. Gas mileage ratings are 22/20-32 miles per gallon. Chevy Malibu This handsome sedan has always been a favorite with the Automobile Journal staff, and it likely will continue be so, especially now that a six speed automobile is standard across the board. The base four has been dropped,but the ultra quiet 2.4 liter, 169 horsepower four, probably the best four among family sedans, has been kept. Look for 17 to 22/26 to 33 miles per gallon. Prices run from $22,695 to $27,735. Chevy HHR Two new colors is about it for 2011. Its standard engine is 2.2 liter, 155 horsepower four. There is also is a 2.4 liter172 horsepower four. Mileage is 22/30 to 32 miles per gallon and the price range is $19,440 to $19,750. Chevy Camaro This handsome terror of the streets is even more powerful than in 2010, with horsepower ratings for the 3.6 liter, 304 horsepower V8 now up to 312 horsepower, and enough to beat out the ford Mustang’s 305 liter V-6 for horsepower supremacy in the V-6 pony car wars. Synergy green is the new color du jour. 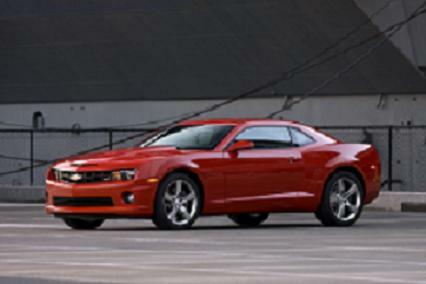 Keep your eyes pealed for the hot new Z28, soon to be roaring your way. And how about this baby? 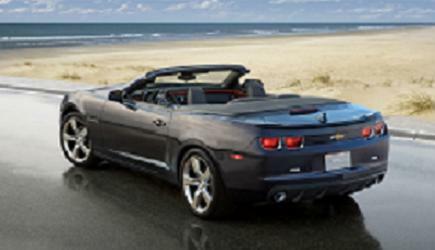 Yep, it's the new 2012 Chevy Camaro convertible. It's due out in November at the upcoming Los Angeles International Auto Show. Stay tuned! Chevrolet Silverado If you are in the market for a pickup truck, here’s a terrific place to start. This year you will be treated to an all new Silverado HD heavy duty pickup, with all new styling and a really, really big grille up front. It also has different suspensions, an all new frame, and other goodies to draw you into the showrooim. You will have a 6.0 liter 360 horsepower V-8 as standard equipment. But check out the all new 6.6 liter, 397 horsepower V-8, too. Towing ratings are now 21,700 for the HD Silverado and you can carry as much as 6,635 pounds in it. Whew! Chevrolet Avalanche It’s got a new two speed transfer case if you get the LTZ 4 wheel drivb package, but that is about it.